Polar Bash Video Slot Guide & Review - Casino Answers! Polar Bash is a 5-reel, 20-line video slot developed by Microgaming, featuring scatter wins, multipliers, a free spins feature and a bonus game. You can play the Polar Bash video slot at Bovada. Coin sizes on the Polar Bash video slot are $0.01, $0.02, $0.05, $0.10, $0.20, $0.25 and $0.50. You can select from 1-20 lines at 1-10 coins per line. The least you can bet on the Polar Bash online slot is a penny per spin with the highest possible bet being $100 per spin. Polar Bash has a wide betting range that suits both casual players and high rollers. 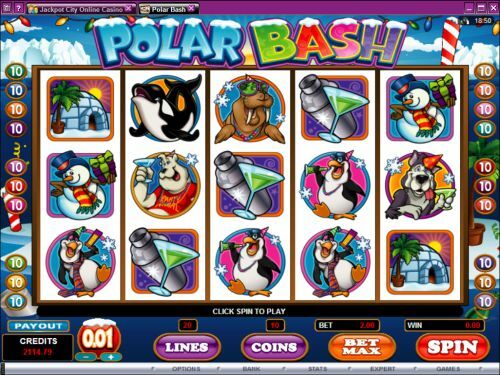 To play the Polar Bash video slot, select your bet and hit the “Spin” button. Or to play it with all 20 lines enabled and 10 coins bet per line, use the “Bet Max” button to automatically spin the reels. 3, 4 or 5 adjacent North Pole scatter symbols will pay out 2X, 10X or 10X your total bet, plus 25 free spins with a 2X multiplier. All bets and lines played during the free spins feature are the same as the triggering bet. The free spins feature can be re-triggered. During the free spins feature, North Pole scatter symbols will not pay out (only re-trigger free spins) and the Fish scatter symbol will have increased payouts, but not trigger the bonus game. All wins occur on enabled paylines only, except for scatter wins. All wins pay left to right only. Only the highest win is paid per selected payline. Payouts are on enabled paylines only. Payline wins are multiplied by the bet per line. Scatter wins are multiplied by the total bet. To use Polar Bash’s autoplay mode, you must hit the “Expert” button. You can now play 5 or 10 autoplay spins. For advanced settings, hit the “AutoPlay” button and you can now play 5, 10, 25, 50, 100, 250 or 500 autoplay spins and stop autoplay if a win exceeds or equals $100, $500, $1000, $5000 or $999. Autoplay will stop on any feature contained in the game. You can stop autoplay at any time. Polar Bash has lots to offer – a lively theme, a very nice top jackpot that few slots can compare with, a bonus game and a free spins feature! You can play the Polar Bash video slot when you sign up and deposit at Bovada! Can players from the USA play the Polar Bash video slot for real money? 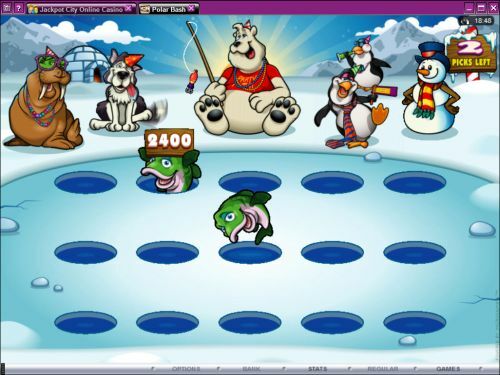 Unfortunately, American players cannot play the Polar Bash online slot game for real money at this time. For a winter-themed video slot that is also USA-friendly, we recommend the Winter Wonders video slot that you can find at Bovada.